Qgiv offers free donation templates to fundrasiers looking to better their Nonprofit. Use them for corporate donation requests, individual donation requests, and more! These days, nearly everyone is on at least one social media platform. Whether they’re liking retweeting, or pinning, social media users are everywhere. The fact can’t be ignored that Facebook is still the social media giant. Despite declining teenage involvement in recent years, baby boomers and millennials are still using Facebook to connect with each other, businesses, and nonprofits. 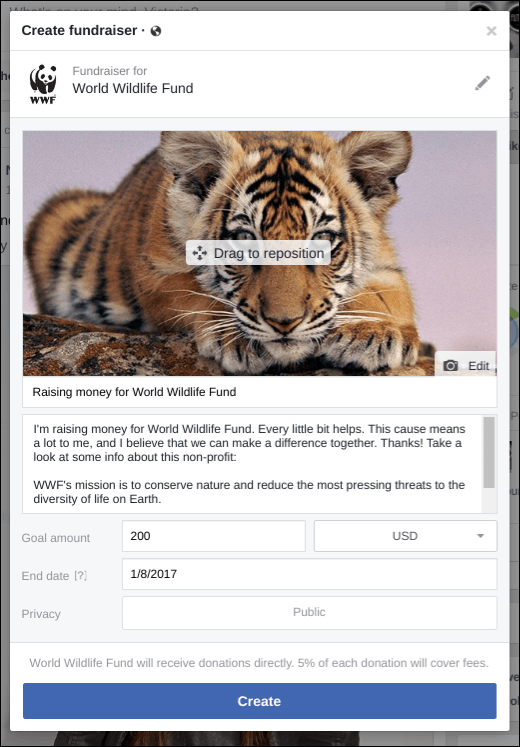 Your organization can ask for donations in any number of ways, and using Facebook to solicit contributions is just one of the tools that your nonprofit should have in its toolbox. Take a look at the following best practices for asking for donations on Facebook! It’s going to be tricky to ask people for donations on Facebook if your organization’s page isn’t up to par or doesn’t have an audience. As with any strategy for asking for donations, you’ll need to start with those closest to your organization and move outward. 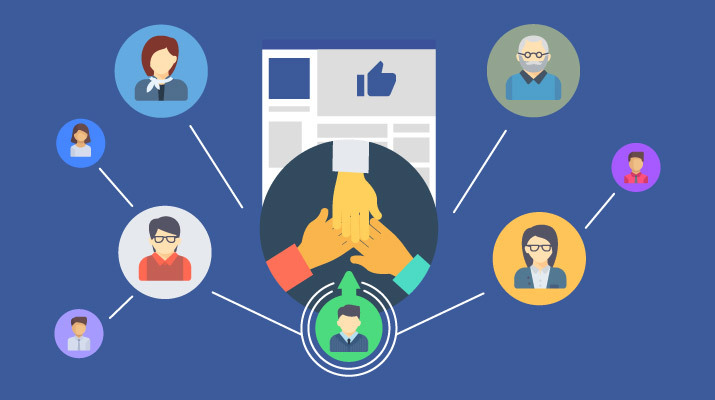 Invite the members of your nonprofit team, your donors and volunteers, and your organization’s leadership to like your Facebook page to form a solid base. Ask those closest to your nonprofit to invite their own friends to like your Facebook page as well, and make sure that you have a way for other individuals to find your Facebook page through other communication channels and on your website. An easy way to do this is to start an awareness campaign. Because Facebook content is inherently shareable, the use of an awareness campaign on Facebook encourages your followers to share a status or post that you create. This can be an image, a video, or just a status. As long as the information is about your nonprofit and the work you do, the medium can differ. The goal is to get as many people as possible to share the content. This increases your nonprofit’s visibility on other people’s newsfeeds, resulting in more likes and potentially more donations. Having a strong Facebook presence is crucial, but it’s important to remember that likes don’t translate into automatic donations. Posting regular content and engaging with your followers helps cultivate new donors and steward the ones you already have. One of the most important steps in Facebook fundraising is to post regular content that encourages your followers to engage with your organization. Posting content on Facebook regularly can take a variety of forms. Let’s take a look at each of those separately. Let’s get this point out of the way first. 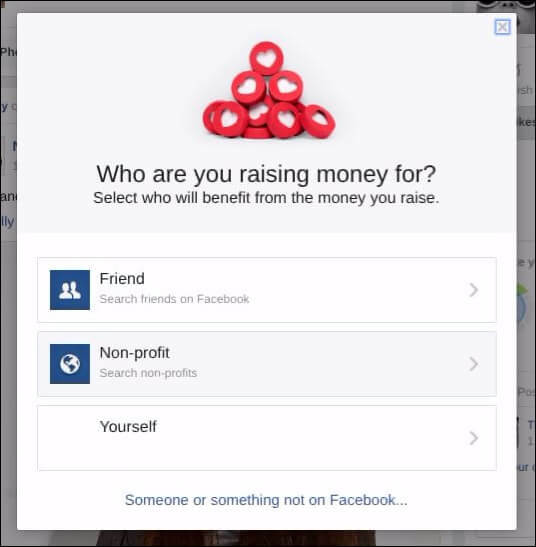 If you want to raise more money by using Facebook fundraising, you have to ask for donations. Plain and simple. Don’t just post “Give us your money,” though. Visual content (pictures or videos). Links to your donation page or general website. Information about what the donations are going toward. It’s important to use visual content in your Facebook posts. You have to find a way to rise above the noise of everyone else’s updates, photos, and statuses. Creating eye-catching images and graphics within your appeals will help draw more people to your posts and consequently, to your donation page. It’s not a good idea to only post appeals on your Facebook page. Followers will quickly tire of your posts if all they see are asks for donations. Instead, vary your content day by day to give followers updates and success stories. Every once in awhile, you should highlight an individual donor or business on Facebook that has made a contribution to your organization. Not only does this allow your organization to give a shout out to your loyal supporters, but it also might encourage other followers to make their own contributions. If your organization completes a project or hosts a successful event, share that moment with your followers. They’ll enjoy seeing the tangible results of other people’s donations and will be motivated to make their own contribution. For instance, if your organization works to help abandoned animals find a new home, post updates whenever a puppy or kitten is adopted. Not only will the adorable pictures appeal to your followers, but they’ll be able to directly see the work that you’re doing. By posting a variety of content on your Facebook page, you will be able to increase your visibility to followers. By incorporating a mixture of straightforward appeals, thank you posts, success stories, and other types of content, you will capture your followers’ interests. This interest can then translate into more donations and successful Facebook fundraising. 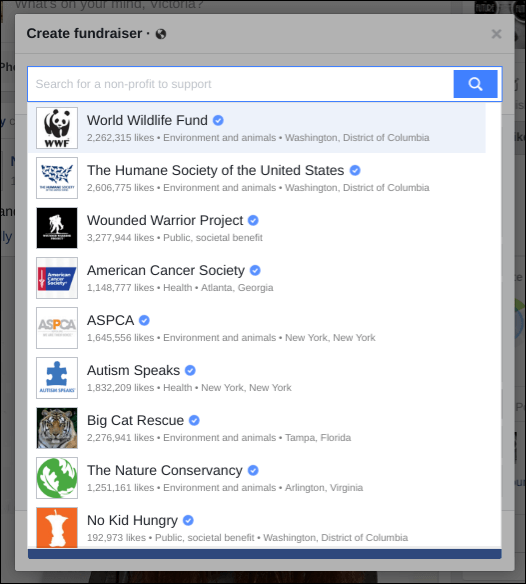 While Facebook itself has offered a donation button to a group of 19 major charities, your nonprofit can have the same function by using Qgiv’s donation tab feature! With a donation tab, your followers can make contributions right on your Facebook page using the same secure Qgiv donation page that you already have on your website. Adding a donation tab to your Facebook page is a good way to encourage donors who want to make a quick contribution. Instead of redirecting them to your online donation page, you can simply ask them to give directly on Facebook. 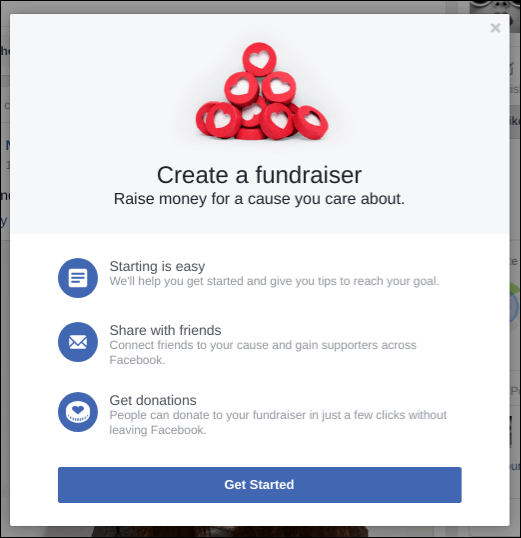 Including information about your donation tab in your Facebook posts and donation asks is the key to Facebook fundraising. It will encourage followers to take advantage of this easy giving method. 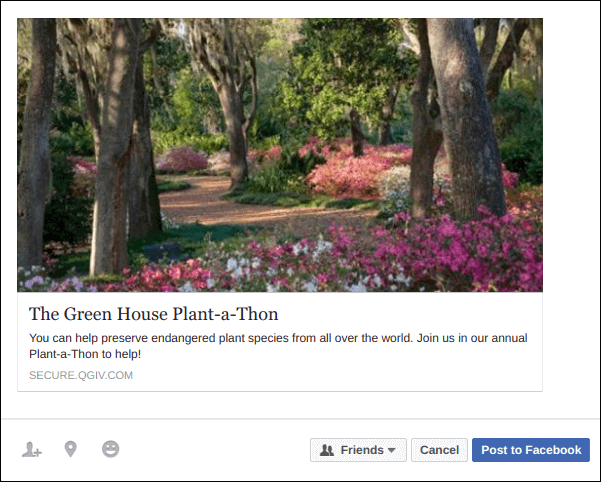 While Qgiv’s donation tab is the easiest way to incorporate Facebook fundraising into your nonprofit’s existing social media, you can also use Facebook’s built in fundraising features. These features make it easy for supporters to fundraise on your behalf. 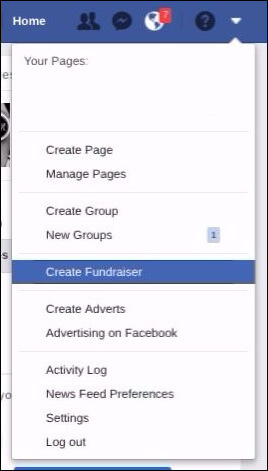 Let’s take a look at the steps to creating a fundraiser on Facebook! Step 1: Select “Create Fundraiser” from the drop down menu bar. Step 2: Click on “Get Started” to begin! Step 3: Choose who you are raising money for. Step 4: Search for your nonprofit. Step 5: Create and publish your first post! Choose the “Edit call to action” option on your page. Insert the link to your organization’s donation form. But it gets even better. Thanks to Qgiv, you can create your very own Facebook donation page so donors can give to your organization without leaving their favorite social media site. Catch your donors while they’re impacted by your Facebook’s compelling photos and videos of your organization hard at work. Your page will encourage them to give and your Facebook form will be right there waiting to collect their donations! Providing donors with the tools to ask for donations on Facebook can help you raise more funds long-term. Plus, donors who are comfortable with social media fundraising are likely to bring huge returns during the peer-to-peer fundraising or crowdfunding campaigns that your nonprofit officially hosts. Facebook — as we’ve discussed previously — is a great way to capitalize on your donors’ extended networks. Which is why it’s so important that both your organization and your donors are familiar with the fundraising ropes! 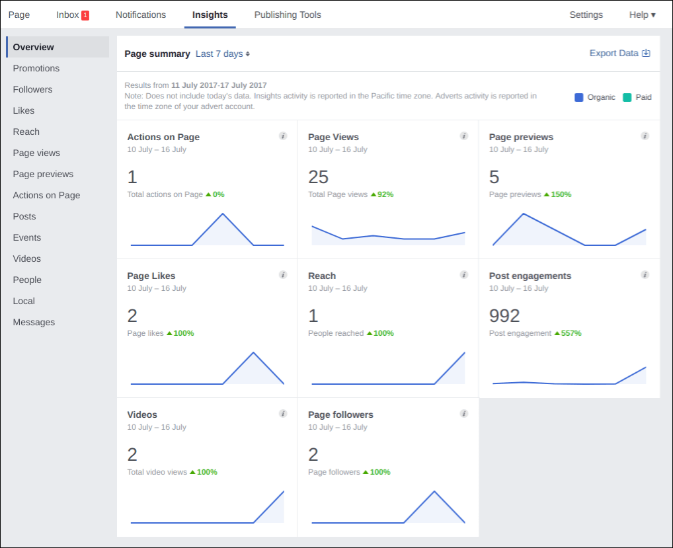 Once you’ve established a presence on Facebook and have implemented the aforementioned best practices, make sure that you’re tracking your page’s insights. Overview. 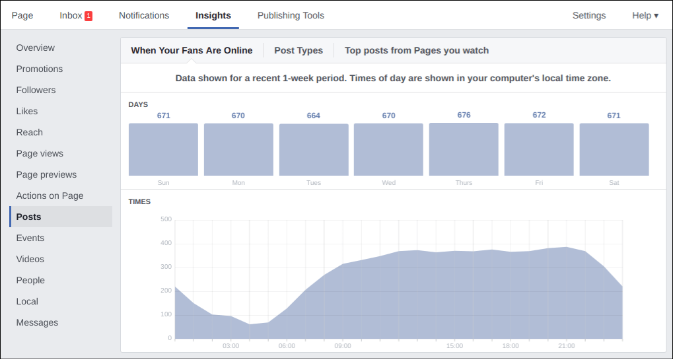 This will be the landing page in your Facebook insight page. You’ll be able to see how many recent likes you have, the reach of your posts, and how many people are interacting with your content with the help of a general graph. Reach. This will tell you how many people your posts have reached through organic means as well as paid advertisements on Facebook. You’ll also be able to look more closely at your likes, comments, and shares over time. Posts. You can determine when your followers are online as well as which statuses, links, and photos have the best reach, clicks, likes, comments, and shares. Although keeping track of your insights is not a direct way to ask for donations, it will allow you to determine which of your posts are most effective at reaching your followers, which ones they are engaging with, and when they are responding to those posts. By following these four best practices for asking for Facebook fundraising, you will be able to grow your donor base and collect more donations with the help of the largest social media platform on the web. Happy asking! Qgiv’s Top 6 Online Donation Tools. Facebook and online fundraising go hand in hand! Check out the best online donation tools to help your organization raise even more to further your cause. Qgiv’s Top 8 Fundraising Software Options. Do you know all 8 of these stellar fundraising software providers? Check out this article to stay in the know and supplement your Facebook fundraising efforts! Qgiv’s Peer-to-Peer Fundraising Guide. Social media is one of the best ways to host a successful peer-to-peer fundraiser. Take a look at this guide for helpful tips and pointers.